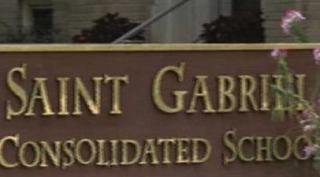 Signage at St. Gabriel Consolidated School in Glendale, Ohio, where an African-American boy’s mother says her son and a female classmate were playing a staring game when her son was suspended. Updated Wednesday, Oct. 7, 6 p.m. EDT: Dan Andriacco, spokesman for the Archdiocese of Cincinnati, issued a statement about the incident, noting that the girl is Asian, not white, as was reported by various media. The archdiocese also indicated that in addition to the African-American boy, a white boy was also suspended in the incident. A 12-year-old Ohio boy was suspended last year for staring at another student while playing the “staring game,” and recently a court upheld the suspension. According to Fox 19, the incident happened in September 2014 at the St. Gabriel Consolidated School in Glendale, Ohio. According to the boy’s parents, who didn’t want him interviewed on camera, the two students were engaged in a “staring game” when, the parents say, their son was disciplined. “The perception is he intimidated her,” Candice Tolbert, the boy’s mother, told the news station. The boy’s parents filed a lawsuit in an attempt to get the suspension removed from their son’s record, noting that the school didn’t give their son due process. The Tolberts told the news station that the incident happened on a Monday. The girl’s parents contacted the school about the incident on the Tuesday, and on that same day, their son was suspended and apparently wrote an apology letter without their knowledge. They say they were not made aware of the suspension until Wednesday. The Tolberts aren’t ready to call the matter an issue of race but told the news station that they are concerned about the way their son was treated in comparison with the treatment in a separate incident involving the same girl. According to the school’s handbook, viewed by the news station, the principal has the final say when issuing punishments. The parents are still debating whether to appeal the judge’s decision. Editor’s note: A previous version of this story incorrectly stated that the girl involved was white. She is Asian.